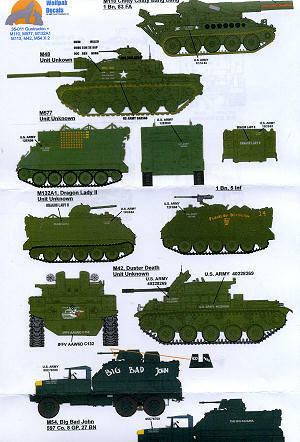 Here is Wolfpak Decals' second military vehicle sheet and this is also one that concentrates on the Vietnam war. I should point out that other than the gun trucks, the rest of these options can pretty well be done out of the box. I should also point out that I have darkened the sheet considerably so you can see the white markings. First up is 'Chitty-Chitty-Bang-Bang', an M110 8 inch howitzer attached to 1st Battalion, 9th Infantry. This uses an Italeri kit. Next is an M-48 named 'Hell Cat' from an unknown unit. This one uses a Tamiya M48 A3. The M577 Command Post is next. This vehicle is studded with kill markings. It is based on the Tamiya kit and there is a resin interior available from aftermarket. 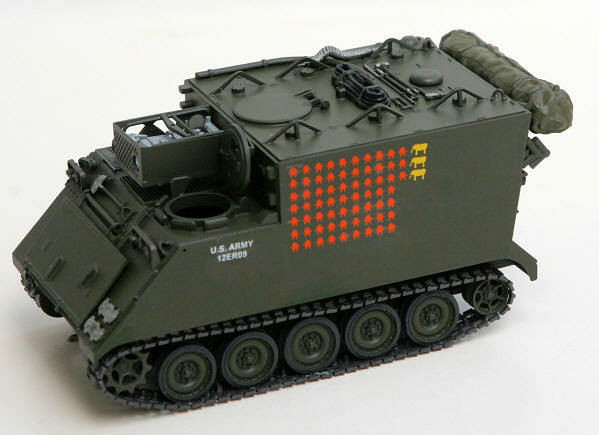 The M-132A1 is 'Dragon Lady II' and uses the Academy M-113A3 Cav to build the flame thrower version. Next to that one is an M-113 named 'Friends of Distinction' with 1 Bn, 5 Inf. Both Academy and Tamiya make kits for this. You will need to add a minigun to it and place twin .50 cals on the sides. Next up is an M-42 Duster named 'Duster Death'. This one uses either a Tamiya or AFV Club kit. Finally we have a pair of gun Trucks. These are both M113s 5 ton trucks. First is 'Big Bad John' with the 8th Gp, 27th Btn, 597th TC. These both use an Italeri M925 truck kit as the basis. The other is 'The Big Kahuna' with the same unit. The sheet contains full information on what is needed in terms of conversion parts for the trucks and general kit information for the others. 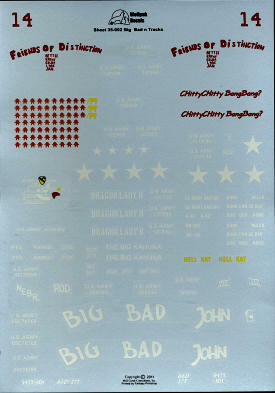 As with the previous sheets, these are superbly printed by Fantasy Printshop and without any registration problems. You will find that the carrier film is a bit more than you may be used to, but it is easily trimmed back before use. Here is an example of a kit using one of these markings. Thanks to WolfPack Decals for the review sample.